“Film music is the classical music of the day,” Redfeld said. “I look at film music as if it's no different from what Bach or Mozart or Stravinsky did – composers throughout history have worked on commission. The first 100 people to order at buysoundtrax.com will received a copy autographed by Dan Redfeld. 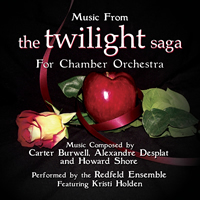 MUSIC FROM THE TWILIGHT SAGA FOR CHAMBER ORCHESTRA will also be available digitally from the usual outlets.